After successfully posting some Combo Dishes from across the world for the first week, it is the turn of the Indian States this week. 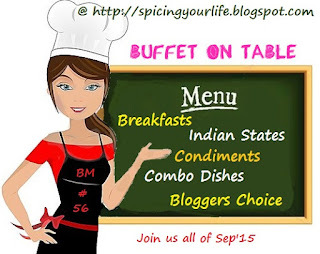 So I shall showcase some popular recipes from 6 different states this week. Today is the turn of the largest Agricultural state in India, Punjab. This recipe has been shared by my dear friend and neighbor, Pooja. In her version, tomato was not included but I added it more out of habit :). The platter today consists of Shalgam ki Sabzi, Roti, Chili Pickle, Methi-Palak Dal, Salad, Buttermilk and Rice. In a pressure cooker, heat oil, and saute the onions. Add ginger and tomato. Saute until tomato is mushy. Add Salt, Green chilies, Sugar, Red Chili Powder, Coriander Powder. Add the chopped turnip and Turmeric. Mix well. Add about a cup of water, close the lid and cook for about 10-12 minutes. After the pressure fizzles out of the pressure cooker, remove the lid and mash the curry gently to make it a coarse mash. Sprinkle garam masala and get the curry to a low simmer until the moisture evaporates. Remove and serve it with Roti and Chili pickle. Reading the recipe I am salivating. That is a filling & balanced meal. This is the way we make slagsm sabzi.Nicely made .That Platter looks delicious. I am glad you added tomato , truly shalgam without tomato is difficult to imagine ! Your platter looks very nice and well made . Nicely presented platter and it looks delicious..
Turnip one of the healthy veggies and great for diabetes. Awesome masala with that. I do make turnips ka sabji is a slightly diff way. more like a dry saute with slightly runny gravy... this thali is sooo inviting ! Wat a spread there, beautifully presented.. Turnip masala sounds prefect to enjoy with some rotis..
What a colourful spread, yummy. Your platter looks so stunning Harini..so well done!.. Turnip is one vegetable that I don't buy. I remember trying it years ago and not liking it. Will have to give it a try again. Your plate looks very inviting. Wasn't expecting a mashed gravy. It must go well with rotis. the photos are styled so beautifully ..just want to dig in!